I am writing this column in my mind on September 21 on the streets of New York City on a warm but cloudy day. 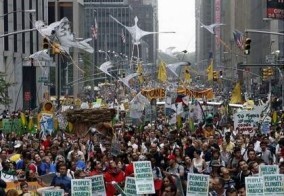 We are here with more than 300,000 others for the People’s Climate March. Some are a little solemn because they understand what lies ahead for the Earth. But the students are excited to march in such a magnificent and festive parade, rhythmically chanting “This is what democracy looks like”. 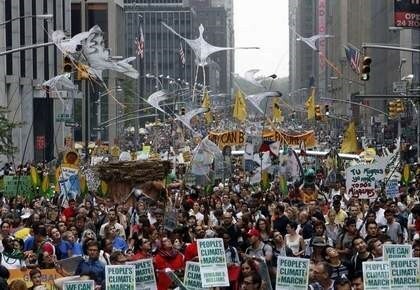 Peoples Climate March — Figure 1 - More than 300,000 demonstrators, including thousands of Vermonters, make their way down Sixth Avenue in New York City during the People’s Climate March on Sept. 21. There are groups from all across society, all over America and all across the world. Marchers from the boroughs flooded by hurricane Sandy, from Bangladesh and island nations, workers displaced by globalization who want to build a renewable energy economy, groups representing Catholic, Buddhist, Protestant and Moslem traditions, and interfaith groups such as Vermont Interfaith Power and Light. They are here because they know that that we the people must speak up, or our governments will continue to hide behind the coat-tails of the wealthy interests they represent. Pretending to believe that climate change is not our responsibility; that sacrificing our children and the Earth to maintain profits makes economic sense. Elders were marching and singing for their grand-children. Infants rode and slept in strollers: they are safe today, but it will take a very determined community effort to protect their future. Students came from many schools and colleges, including Middlebury, UVM and Burr and Burton. All these see their moral responsibility for the Earth. We may be angry at the self-centered passivity of our leaders, but we are not helpless, we are determined and resolute. Before the collapse of the medieval period, it was heresy to question that the Earth might not be the center of the universe. Galileo had to deny what he saw through his telescope, or be burned at the stake. Now the idolatry of political and financial doctrines have made it a heresy to recognize how our fossil fuel driven economy is driving rapid climate change. Melting the icecaps will flood not just Wall Street, but millions in low-lying areas across the globe. So Climate Justice was a strong theme: we do not have the right to destroy so much of life on this Earth to protect out idols. There were windmills and solar panels marching as a reminder that creating an energy efficient society powered by renewable energy is now a possible future that would emerge rapidly from a tax on fossil carbon. There were dance groups and marching bands from around the world, and Vermont’s Bread and Puppet Theater. A lone bugle sounded the reveille, and people cheered for every wake-up call. Mayor De Blasio, showed up, after announcing a plan for NYC to reduce greenhouse gas emissions by 80% by 2050, starting with huge efforts to improve the energy efficiency of public and private buildings. He said: "Climate change is an existential threat to New Yorkers and our planet. Acting now is nothing short of a moral imperative." Energy retrofits to the Empire State Building in progress will reduce its energy consumption by 38%. All the cities and towns in Vermont should follow suit. Governor Christie stayed away, paralyzed between the recent reality of Sandy, the upcoming election and the power and stupidity of the Republican right. I saw one older women marching with a refreshing sign that said “I am a Republican that believes in climate change”! The marchers, including 2000 Vermonters, have returned home to contrast the reality of their home towns with their vision of creating a sustainable future. This will need all of us, in every community, this decade and for decades into the future. Yes, those who see and understand must lead. Not everything we have set in progress can be undone, but our efforts now will pay off for the Earth and for those who come after us. Look at the autumn colors and remember.